The first in an occasional series of interviews with Creative Coquetdale folk by Katie Scott. Jack Wilkinson is easy to recognise with his distinctive waistcoat and ‘Donovan’ cap. He is well known throughout Coquetdale as a most charismatic musician and singer-songwriter. A defining aspect of Jack’s life was contracting polio as a child, which caused a life-long disability. Throughout childhood Jack had operations and hospital stays of six years, off and on. Polio left Jack with a weakened leg but a strong-minded and generous spirit. As a child Jack loved listening to his father playing music and singing. He recalls the life-changing day his father came home with a gift. Jack soon learned to play guitar, then banjo ukulele, and mandolin. Working for 44 years at Metal Spinners, Jack started out on the machines, soon becoming a charge hand, works manager, and many other posts. An exciting aspect of this job was that Jack got to travel abroad. And it was when he was working in Northern Ireland that he learned about traditional Irish music, which he loves with a passion. Jack has had great success as a folk singer/songwriter and performer. He formed The Northumbrians in 1968. They appeared on Hughie Green’s Opportunity Knocks, and regularly performed on Tyne Tees’ Walk Right In. A high spot was when The Northumbrians performed at the Royal Festival Hall at an event hosted by Bob Monkhouse. Jack and his wife, Olwen moved to Netherton in 2000. But sadly, not long after they settled in the village, in October, Olwen suffered a stroke, and died the following December. Jack’s neighbours and friends helped at the difficult time when he had partially retired and mostly given up music. Jack and Jennifer created the Netherton Folk Club. The popular monthly event was known throughout Coquetdale. People would bring food and drink, and many different musicians would play. The Netherton Folk Club has now disbanded as Jack has begun a new venture: The Cheviot Folk Club, held at the Cross Keys Pub in Thropton. This is proving to be just as popular, and attracting such legendary performers as Rod Clements, who will be playing at the February gig. Jack always thinks of those less fortunate than himself, and has raised thousands for charities and in 2007 Alnwick District Council presented him with Unsung Hero award. Jack has also worked with the homeless in Newcastle. I asked Jack to tell me which song meant a lot to him – he chose Blowing in the Wind by Bob Dylan. Of all the many creative folk in Coquetdale, Jack Wilkinson stands out as one of the most charismatic, talented and good-hearted. 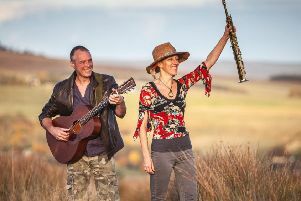 The next Cheviot Folk Club, with Rod Clements and Ian Thomson, takes place at the Cross Keys on Saturday, February 16, at 7.30pm. Jack’s CD is for sale in the Narrow Nick in Rothbury.